2 channels approx 10x14yds. 2 groups work in each channel. After making eye contact, Attacker (A) and Defender (D) move through ladder with one foot in each space. At the end of the ladder, A then tries to fakeout D and reach cone to the left or right (black cones in diagram) before defender can block it. Attacker has 5 seconds to score after coming out of the ladder. After each attack, players change roles. Ladder competition. 60 second games. Motor skill development - Agility, Balance, Acceleration. Use of body feints to fakeout the defender. 2 channels approx 10x14yds. 4 players per channel. Players are instructed to &apos;zig-zag&apos; from side to side throughout the channel. When approaching a sideline, players are instructed to perform a L-Turn, or, a V-Move to change direction. Entry: Messi Touches (touch on every step). Execution 1: 2 touches (sole-inside). Break opponents defensive line with second touch. Execution 2: Apply disguise (use of arms, eyes, body to fake shot/pass). Exit: Long touch out of the move and accelerate away. Attacker (A) plays double pass with Defender (D). Defender then applies pressure. A looks to break defensive line with 1st touch and then play forwards into Target (T) on the opposite side. Activity then begins again from opposite side. 1st touch to break line of pressure or manipulate defenders positioning? Option 1: Play forwards early. Option 2: If penetrating pass is denied, use V-Move/L-Turn to create space to play forwards. Attacker looks to play into Target after double pass with Defender. Target player has only 1 touch and Attacker must look to support quickly, receive the return pass and then look to play to one of two goals. Attacker and Target gain 1 point each if goal is scored. Defender gains 1 point by winning the ball and dribbling forwards through yellow gate within 3 seconds. First player to 5 points wins. Can attacker break line of pressure with 1st touch, or, manipulate defenders positioning if pressure is slow/late? Apply disguise to moves in order to create space to play forwards. 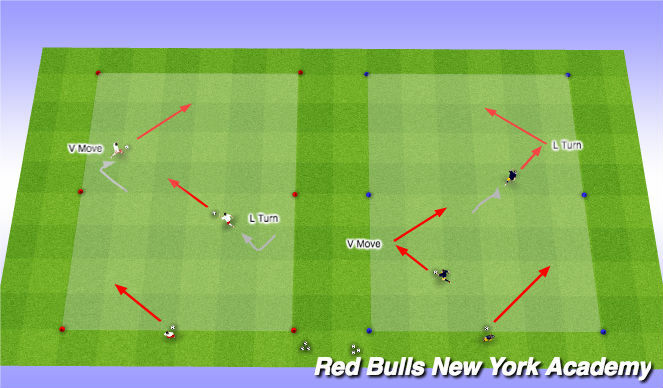 Change speed in attack and look to support T quickly (movement to lose opponent and support T).